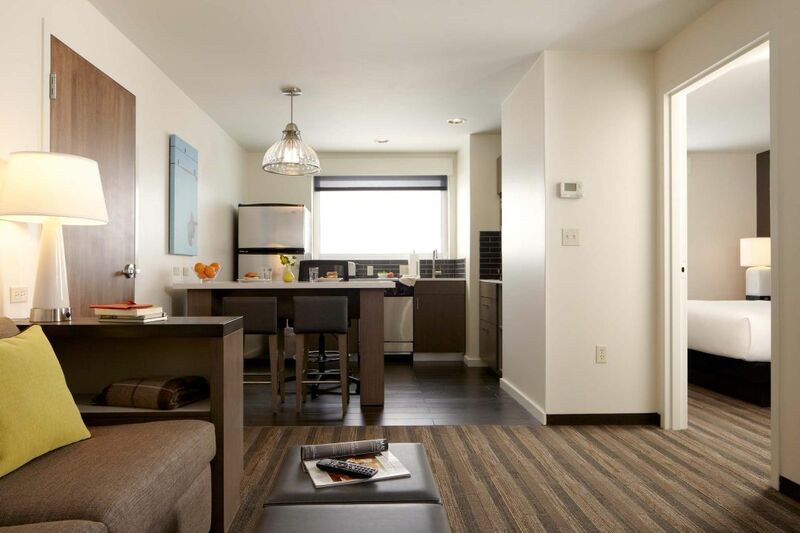 Whether you are visiting Colorado Springs with family, in town for a long-term work assignment or just enjoying a weekend away, Hyatt House Colorado Springs has suites to fit all your needs. From standard and studio options to one-bedroom suites, our accommodations are a step above the rest. Plus, many of our suites feature full kitchens, which we’re happy to stock with our complimentary grocery shopping service. Our Double Bed Suite gives you plenty of space to work and relax. Enjoy two double plush Hyatt Grand Beds® with a separate bath and spacious closet. In addition we offer living area with a conference table, an oversized Cozy Corner sofa sleeper, TV and DVD player, as well as a fully-equipped kitchen. The suite also has a dedicated work space, including a full-size desk, dual-line phone, voicemail and complimentary high-speed Internet access. All Hyatt House® hotels are smoke-free. Our one-bedroom suite gives you plenty of privacy, plus ample space to work and relax. In addition to a separate bedroom with one king plush Hyatt Grand Bed®, separate bathroom, spacious closet and TV, we offer a living area with an oversized Cozy Corner sofa sleeper, TV and DVD player, as well as a fully-equipped kitchen. The suite also has a dedicated work space, including a full-size desk, dual-line phone, voicemail and complimentary high-speed Internet access. All Hyatt House® hotels are smoke-free. Our studio suite gives you ample space to work and relax. The spacious suite includes a living area, a sleeping area with one king plush Hyatt Grand Bed®, and fully-equipped kitchen, as well as a spacious closet, TV, DVD player and sofa sleeper. The suite also has a dedicated work space, including a full-size desk, dual-line phone, voicemail and complimentary high-speed Internet access. All Hyatt House® hotels are smoke-free. Our two bedroom, two bathroom suites are perfect for families and corporate travelers attending the same meeting or event. These large suites offer each traveler a high degree of privacy and functionality. Each bedroom has its own bathroom, spacious closet, television and telephone line, ensuring that each guest can unwind and relax. We also offer a living area with a sofa sleeper, TV and DVD player, as well as a fully-equipped kitchen. The suite also has a dedicated work space, including a full-size desk, dual-line phone, voicemail and complimentary high-speed Internet access. The option to bill each room separately is available upon request. All Hyatt House® hotels are smoke-free. When booking the guestroom room type, room type and bed type will be appointed at check-in. The studio suite is a large, open room with a spacious living area that is divided by a contemporary wood wall housing the flat screen HDTV, which swivels to face either the living area or bedroom area. Our one-bedroom Colorado Springs suites give you plenty of privacy - plus space to spread out and relax. In addition to the separate bedroom with its own bath, walk-in closet and TV, we offer a living area with sofa, TV and DVD, as well as a fully-equipped kitchen. These Colorado Spring suites also have a dedicated work space, including a full-size desk, dual-line phone, voice mail and complimentary wireless high-speed Internet access. For even more space - our two-bedroom suite is the perfect solution. Each bedroom has its own bathroom, closet, TV, phone and private voice mailbox. The shared living area is equipped with a sofa, TV and DVD and a fully-equipped kitchen. We can even bill each room separately, if it's more convenient. All Hyatt House® hotels are smoke-free. Our accessible studio suite gives you ample space to work and relax. The spacious suite includes a living area, a sleeping area with one king plush Hyatt Grand Bed®, separate bathroom with bathtub and fully-equipped kitchen, as well as a spacious closet, TV, DVD player and sofa sleeper. The suite also has a dedicated work space, including a full-size desk, dual-line phone, voicemail and complimentary high-speed Internet access. All Hyatt House® hotels are smoke-free. Our accessible one-bedroom suite gives you plenty of privacy, plus ample space to work and relax. In addition to a separate bedroom with one double plush Hyatt Grand Bed®, separate bathroom with roll-in shower, spacious closet and TV, we offer a living area with an oversized Cozy Corner sofa sleeper, TV and DVD player, as well as a fully-equipped kitchen. The suite also has a dedicated work space, including a full-size desk, dual-line phone, voicemail and complimentary high-speed Internet access. All Hyatt House® hotels are smoke-free. Our accessible one-bedroom suite gives you plenty of privacy, plus ample space to work and relax. In addition to a separate bedroom with one double plush Hyatt Grand Bed®, separate bathroom with bathtub, spacious closet and TV, we offer a living area with an oversized Cozy Corner sofa sleeper, TV and DVD player, as well as a fully-equipped kitchen. The suite also has a dedicated work space, including a full-size desk, dual-line phone, voicemail and complimentary high-speed Internet access. All Hyatt House® hotels are smoke-free.